Rats (Rattus spp.) are adapted to hear very well, and they use the sense to communicate at ranges we cannot even detect. Because their hearing is so sensitive, they're much more attuned to noises in their environment that a human ear couldn’t even pick up, such as the sound of a thumb and forefinger rubbing together. It's important that pet owners understand rat hearing so they can be sensitive to it. Rats belong to the order Rodentia and the family Muroidea. The genus name is Rattus, under which dozens and dozens of rat species are classed. Rats are mammals, just like humans, and therefore possess many of the same bodily attributes: bilateral symmetry, two arms and two legs, eyes, nose and mouth. They also possess two ears, just like humans do, though their hearing range is significantly higher than ours. Rats have excellent hearing and can pick up noise in the ultrasound range, which is much higher than our own. This means ordinary noises, like a crinkling bag, are much louder and more distressing to them than they would be to us, and they can hear noises that we’ve never heard -- like the echolocation of bats outside the house. The hearing range of a rat is even better than that of dogs and cats, both of which can hear at significantly higher ranges than humans can. A noise in the ultrasound range is anything that emits sound at a frequency above above 20 kilohertz, or 20,000 hertz, and is called ultrasound because it's above the range of what we humans hear. Rats hear all noises between 200 hertz and 80 or 90 kilohertz. Rats use their sensitive hearing to communicate with their young, mates and others in their community, as well as to locate food sources. Their vocalizations generally fall in the range between 20 and 50 kilohertz. Because rats have such better hearing than we do, and are sensitive of sounds in a range we cannot even hear, it's easy to create a lot of noise. For a rat, this amount of sound might make his world overwhelming. When keeping rats, try to maintain them in the quietest part of your house, where they will be protected from the loudest activities and safe from inquisitive predators (like house cats). Use care when opening and closing their cages, and try not to leave electronics -- which create a distinct hum in the rat’s hearing range -- on nearby. 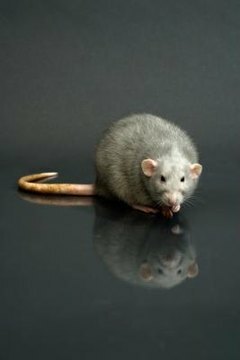 Rat Behavior: What Do Rats Hear?